Las Vegas, NV (September 28, 2016) On Tuesday, September 27, Nevada Heart and Vascular Centers Board Certified Interventional Cardiologist Rafael Valencia M.D., F.A.C.C., implanted a patient with the world’s first FDA-approved dissolving heart stent. The Absorb bioresorbable vascular scaffold is a major advance in the treatment of coronary artery disease, which affects 15 million people in the United States and remains a leading cause of death worldwide despite decades of therapeutic advances. It was a privilege to be given the opportunity to be part of the first interventional cardiology team in Southern Nevada to implant the new fully bioresorbable Absorb coronary stent. 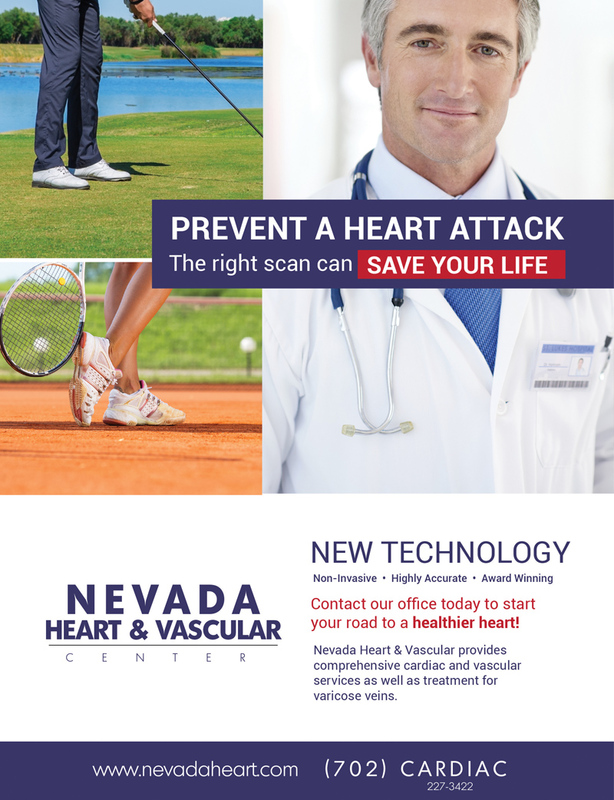 Today is a great example of how our medical community, in particular the physicians of Nevada Heart and Vascular Center and the dedicated cardiovascular staff at Desert Springs Hospital, in partnership with leading health industry companies can deliver innovative and state of the art cardiac care to patients in Southern Nevada. This novel technology promises to be a great addition to the treatment options we can offer our patients to improve their health and well being. 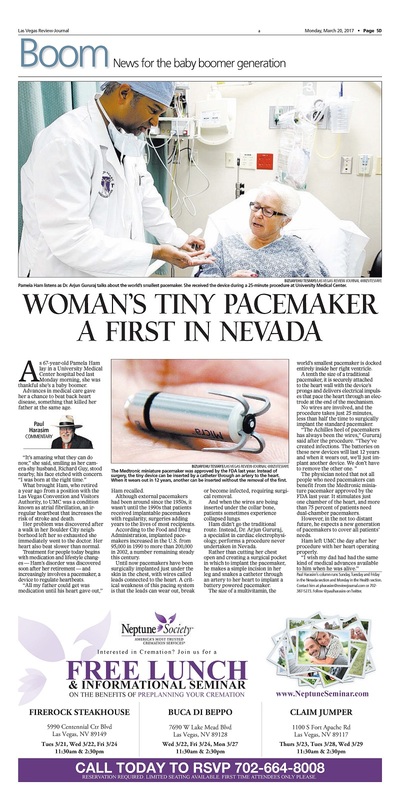 The physicians of Nevada Heart and Vascular Center are excited to be able to deliver this innovative therapy to patients throughout the Las Vegas valley, Said Dr. Valencia. 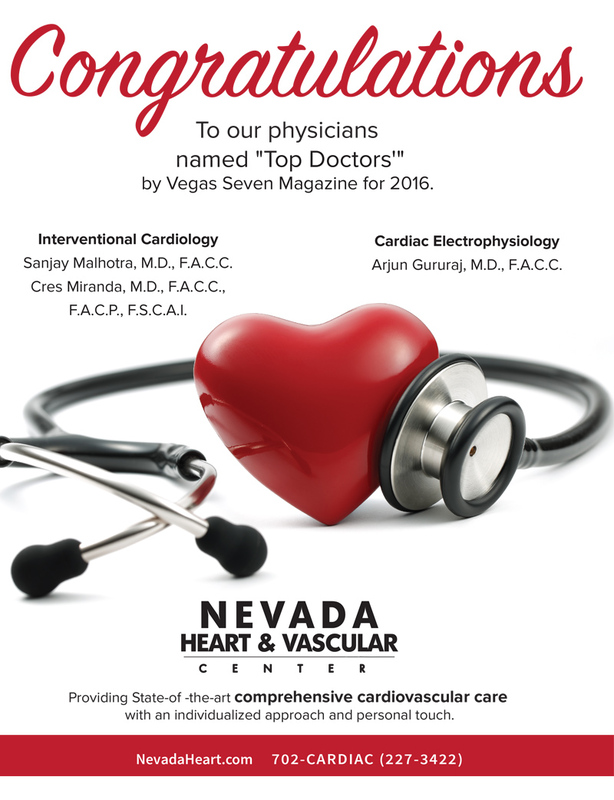 Nevada Heart And Vascular’s Chowdhury H. Ahsan, M.D. 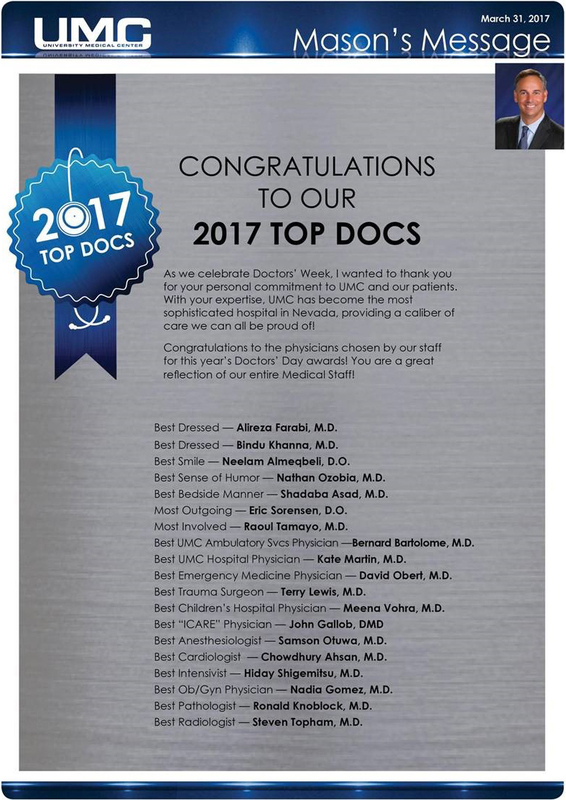 LAS VEGAS, June 20, 2016 /PRNewswire/ — Nevada Heart and Vascular Center is proud to congratulate Chowdhury H. Ahsan, M.D., F.A.C.C. F.S.C.A.I. for his recent election to Alpha Omega Alpha, the medical honor society. This honor was awarded by medical students, residents and faculty members from University of Nevada School of Medicine to recognize Dr. Ahsan’s academic excellence, dedication to medicine as a profession, and service to patients. Dr. Ahsan received this prestigious award as result of his work as director of the Cardiology Fellowship program at the university. It happened to Benjamin Martin shortly after he woke up on a winter morning in 2010 — he felt as though drums were pounding in his chest, as though thunder was rumbling there. And then, just like that, the rapid heartbeat that took his breath away, ended. “The second I walked into the hospital emergency room, it all stopped,” he said. Tests done on the academic counselor at Rancho High School showed no evidence of heart disease. During the next several months, he experienced minor sensations of his heart skipping a beat, a kind of fluttering inside his chest, but nothing serious enough to again send him to the hospital. Doctors told him it may be the way his body dealt with stress or caffeine. But when he visited his parents in California during the summer of 2011, there was a day when the sensations in his chest were no longer minor. “It felt like my heart was flip-flopping in my chest,” he said. With medication, emergency room doctors tried to get his heart back into its normal rhythm, which Martin says is about 75 beats a minute. But it raced 150 to 200 beats a minute, making it difficult for Martin to breathe. Finally, Martin was briefly anesthetized and controlled electric shocks were used to bring his heart back into its normal rhythm. “A test showed right away (through an electrocardiogram) I had atrial fibrillation,” he said. 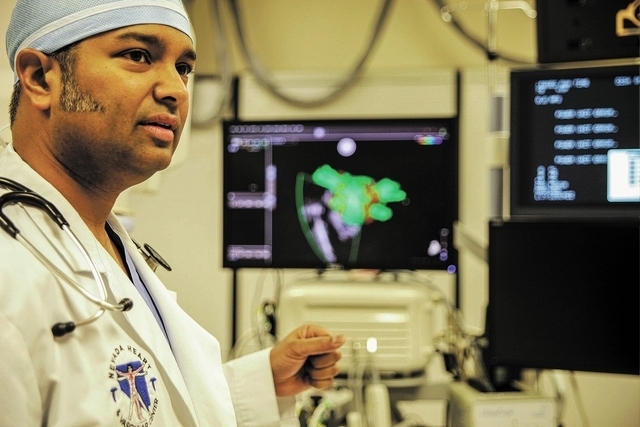 Thanks to Dr. Arjun Gururaj’s expertise, Martin no longer suffers from atrial fibrillation. During a procedure at Sunrise Hospital and Medical Center, the physician burned away tissue causing the problem inside Martin’s heart. Atrial fibrillation, also known as AFib, is a common form of arrhythmia, a problem with the rate or rhythm of the heartbeat. Characterized by a rapid and irregular heartbeat caused when the top chambers of the heart (the atria) quiver (fibrillate) erratically, AFib affects more than 2.5 million American adults. The condition’s usual causes are coronary heart disease, high blood pressure, structural defects of the heart and its valves, lung disease or other disorders, but in about 10 percent of the cases, as in Martin’s, no cause can be found. Besides causing heart palpitation, debilitating pain and chronic fatigue, AFib can also increase the risk of stroke fivefold. Because the atria are beating irregularly and rapidly, blood does not flow through them as quickly, making the blood likelier to clot. Should the clot be pumped out of the heart, it can travel to the brain, resulting in a stroke. According to the Heart Rhythm Society, the median age for someone with AFib is 75 and the condition contributes to 88,000 annual deaths in the United States. Martin decided against medications because they often had side effects that would make him sluggish. 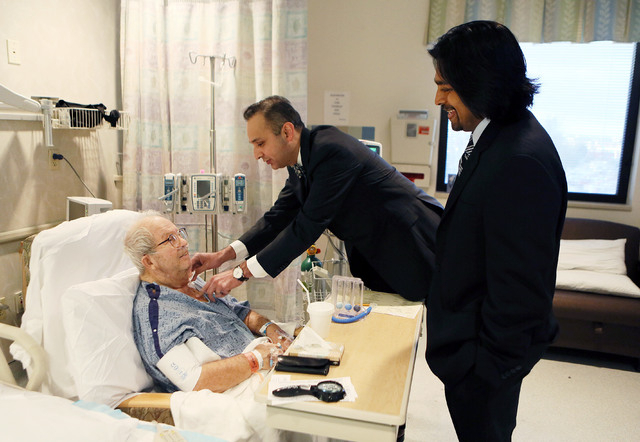 He chose Gururaj, a specialist in cardiology, to perform the catheter ablation in fall 2011. Martin said he appreciated how the physician explained the procedure to him. Gururaj said Martin had what is known as paroxysmal atrial fibrillation, which lasts from a few seconds to days, then stops on its own. This type of AFib can develop into the more serious persistent or permanent form of the condition. So that his patients understand what he does, Gururaj said he must give them some background on the heart, which has its own electrical system. That system sends electrical signals around the heart, telling it when to contract and pump blood throughout the body. The electrical signals begin from a group of cells in the right atrium, called the sinus node, which functions as the heart’s pacemaker and makes sure the heart is beating at a normal rate. If the electrical signals flowing through the heart don’t communicate correctly with the heart muscle, the heart starts beating in an abnormal pattern, an arrhythmia. Gururaj said it is up to him to identify the abnormal electrical activity’s origin, often in the left atrium, and ablate the tissue from which it is coming, often microscopic defects in the heart muscle. Under X-ray guidance, catheters are advanced through the leg to the heart. During the procedure that can take as long as five hours, the tip of the catheter delivers radiofrequency energy to burn the abnormal tissue causing the problem. Small scars eventually form, preventing the abnormal signals that cause atrial fibrillation from reaching the rest of the atrium. While the scars are healing, Gururaj said it is normal for some atrial fibrillation to occur. Martin said he felt minor episodes for a few months, but nothing serious. He said he has felt only an occasional “skipped beat” during the past three years. Gururaj said the success rate of catheter ablation for young people — which keeps them in the hospital for only about 24 hours — is about 80 percent. “Mr. Martin has done wonderfully,” he said. It is possible, the doctor said, that a second procedure may be necessary to treat other abnormal tissue in the future. “That’s the million-dollar question, whether he will, ” the doctor said. He noted that few studies have been done on younger patients. A study released in 2012 by Dr. Rashmee U. Shah of Stanford University was not entirely positive about catheter ablation for AFib. It showed that of 4,156 patients who underwent it, 5.1 percent developed complications while hospitalized, including bleeding or perforation. And almost one in 10 were readmitted to the hospital within 30 days, according to the research published in the Journal of the American College of Cardiology. The complications that developed during the initial hospitalization include stroke and hemorrhage. One patient died. Readmission for recurrences of arrhythmias or additional ablations were 22 percent at one year and 30 percent at two years. Atrial fibrillation ablation, Dr. David E. Haines wrote in a comment to the study, has results that “can be characterized as mediocre at best” and cautioned against the performance of the complex procedure by clinicians with insufficient experience. Martin couldn’t be happier with Gururaj’s work. 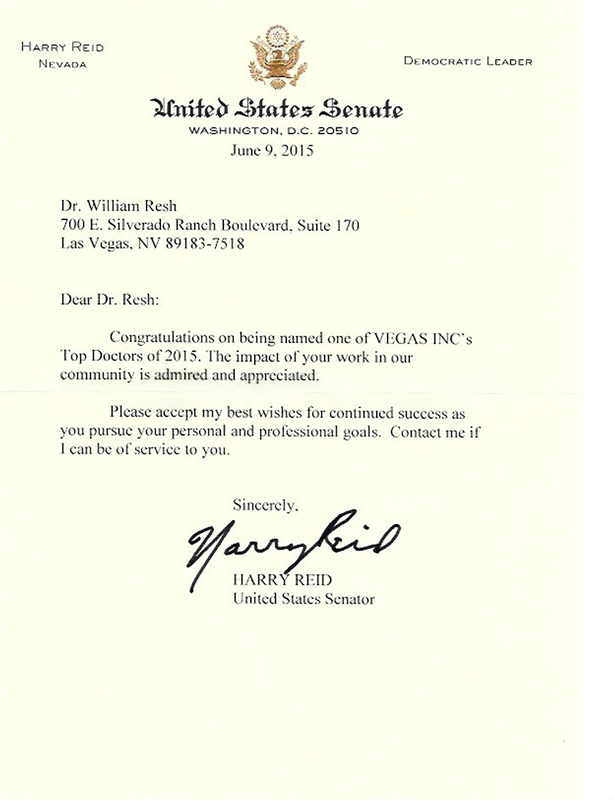 Nevada Heart and Vascular would like to congratulate Dr. Bill Resh on passing his 10-year Board Re-Certification. We are honored to have you leading Nevada Heart and Vascular Center. Again, Congratulations on this wonderful achievement! Nevada Heart and Vacular Center is proud to welcome the addition of Dr. Deepak Sharma. Dr. Deepak Sharma received his medical degree from JLN Medical College, India. He was accepted as a reaching fellow at Dalhousie University, Halifax, Canada. 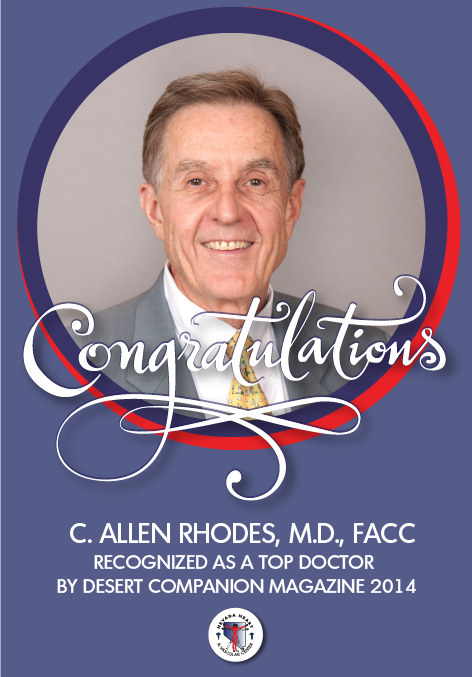 He completed his residency training at the University Of Nevada School of Medicine, and fellowship in cardiology at The University of California, San Francisco. Dr. Sharma completed an interventional cardiology fellowship at St. John Hospital and medical center in Detroit, Michigan, where he served as chief interventional fellow. Dr. Sharma specializes in cardiovascular disease including peripheral arterial disease and venous disease of the lower extremities. In his free time, Dr. Sharma enjoys traveling, nature, soccer, cricket, racquetball and spending time with his family.